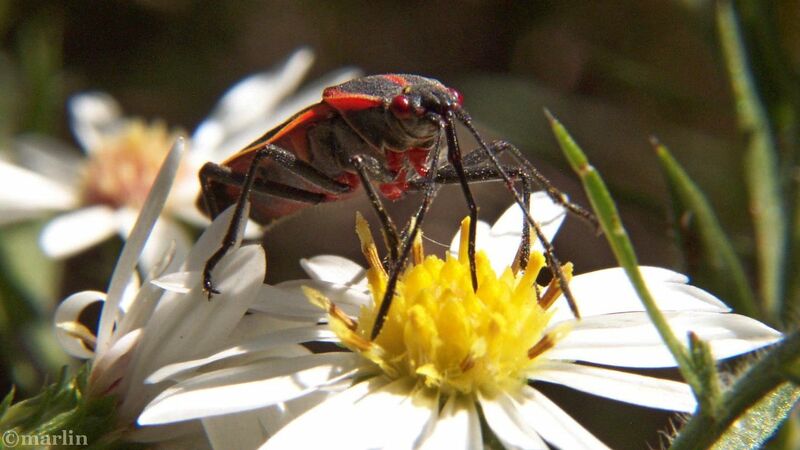 The Box Elder bug is a member of Family Rhopalidae – Scentless Plant Bugs. These pesky little critters are the bane of many a homeowner’s existence in the fall, when adult bugs seeking overwintering shelter cluster on structures in preparation for overwintering. 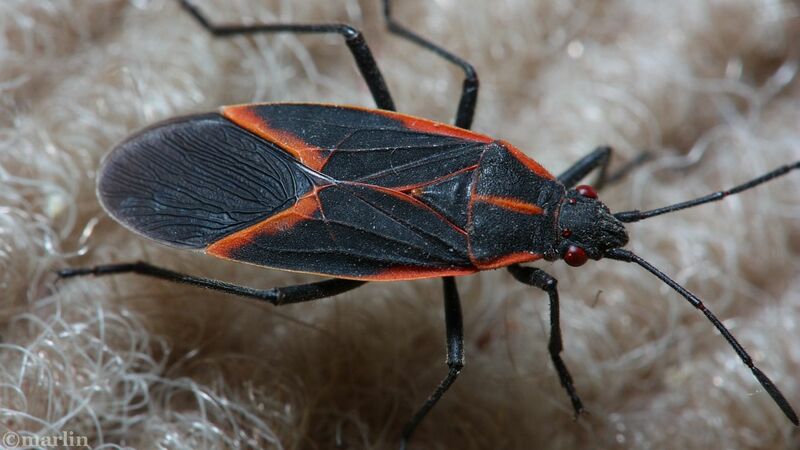 These bugs can fit through the tiniest of spaces, and somehow manage to infest the interior of many older homes that are not sealed properly. Common to these infestations are the presence of the bugs’ host plants: Box elder and other trees in the maple family Aceraceae. I have several large silver maples that supported an enormous population, year after year, until I took action and began a campaign of eradication that has been wildly successful – I have reduced their numbers so much I rarely see them anymore. Without pesticides. 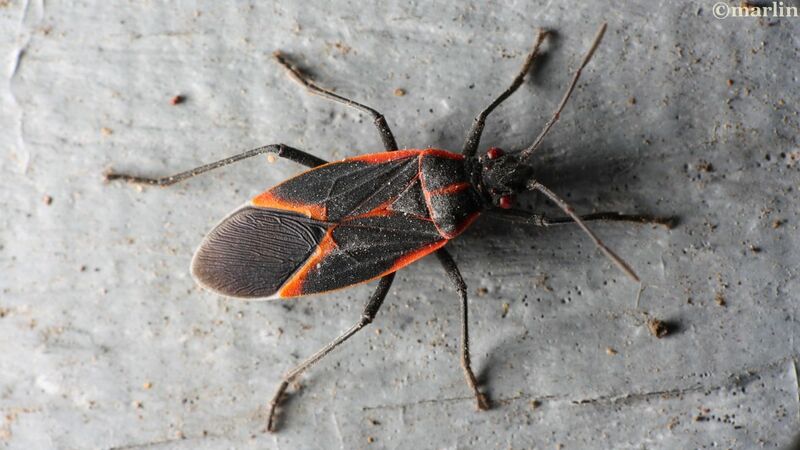 In the warm months, box elder bugs cement clutches of eggs onto any handy surface near the host trees where seeds are available. 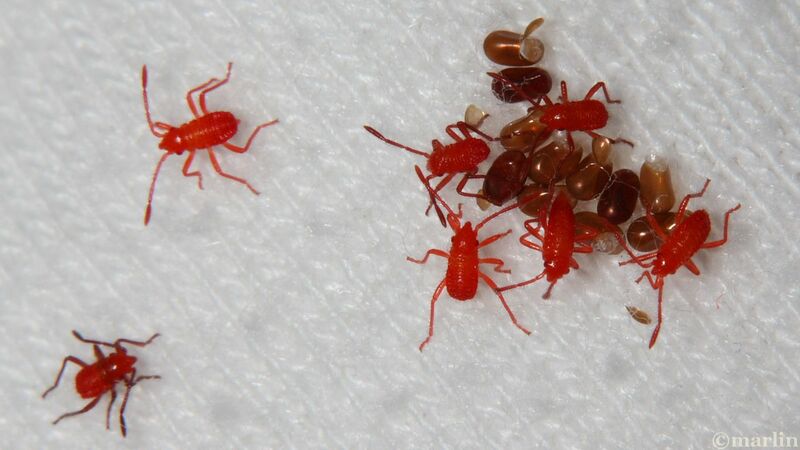 The eggs hatch in a little over a week, and the nymphs begin their 5-instar march to adulthood. As each succeeding generation matures, it begins the cycle anew as quickly as possible and begin plastering eggs all over the place. This cycle repeats until late autumn when the last adults try to find protected overwintering sites. There are always a mix of different instars hiding amidst the maple seeds that fall into lawns or collect in protected places like gutters. All instars eat maple seeds; later instars are carnivorous scavengers of insect carcasses as well. Late instar nymphs can be found congregating anywhere there are maple seeds lying around. An adult female can lay thousands of eggs in her lifetime, and if there is sufficient food, you will find the population increases every year until saturation is reached. If you find yourself overrun by these beauties, just mix a little dish soap and water and put it in a spray bottle. You can kill vast quantities of both adults and all instars with a simple spritz (I’m talking outdoors – don’t spray this sticky crap on your carpets!) I’m not sure if it kills eggs. Raking up as many maple seeds as possible and killing as many bugs – adults and nymphs – as possible will help suppress the succeeding year’s numbers. Cleaning up leaf or lawn litter in flowerbeds or around foundations can deprive the developing horde of the cover and food they need. 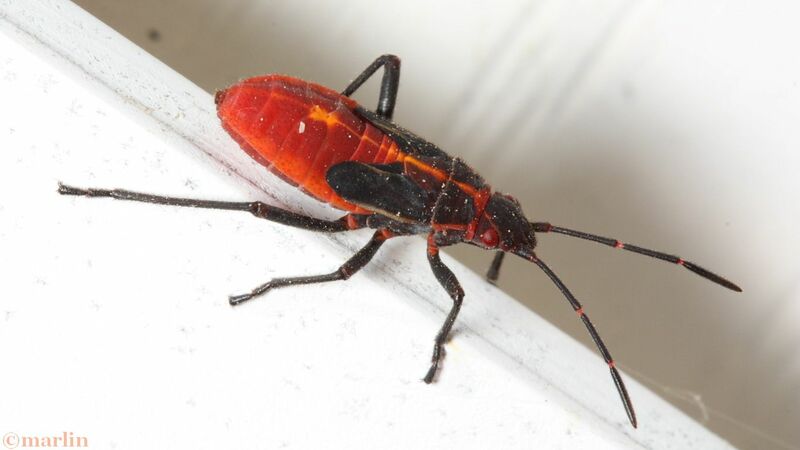 Maple seeds clogging gutters create the perfect environment for breeding box elder bugs. The seeds trap moisture and the sun heats everything up, and you’ll be astounded at the number of bugs this set up can create. Have your gutters cleaned as soon as the maples have dumped their seeds, and you will see an immediate decrease in the year-over-year number of adults invading your personal space. I was heartened to discover paper wasps (Polistes) prey on box elder bug nymphs. No contest! 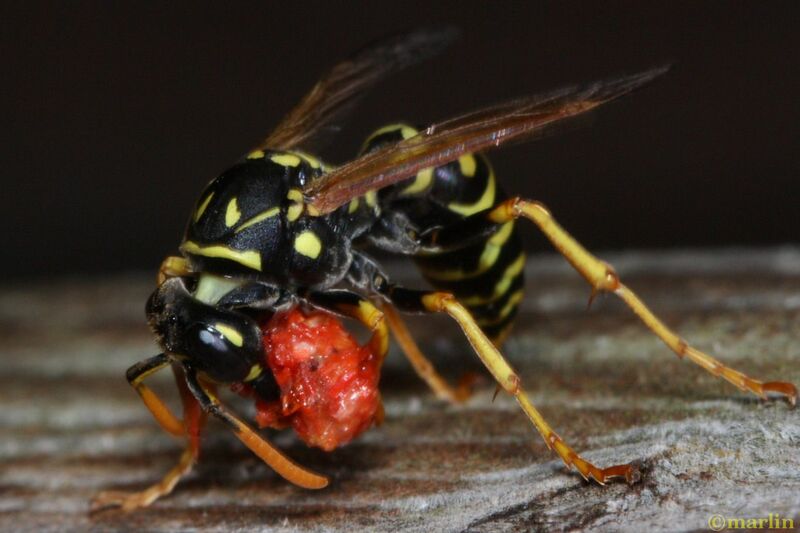 The wasp chews up the nymph and discards the exoskeleton, leaving a nice ball ‘o’ flesh to carry home to her brood. Disgusting but efficient. This is the only example of an insect preying on box elders I have ever observed.